Mr. U-Haul, a Wright Desert Home, and Unsolved Mysteries. 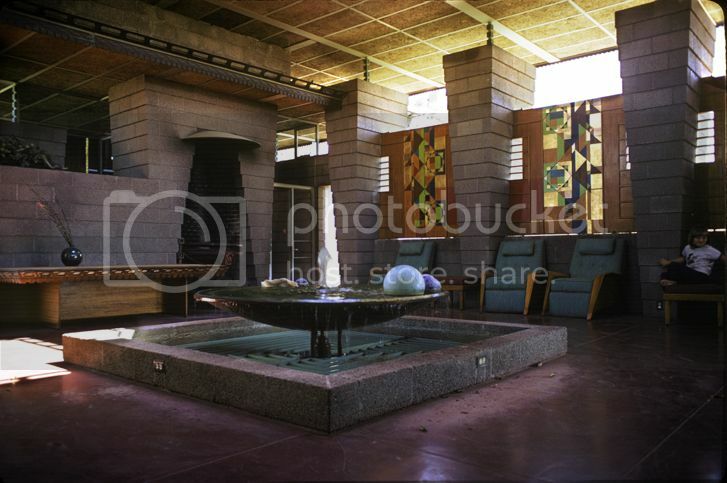 The H.C. Price Residence, Phoenix, AZ, 1954. Frank Lloyd Wright began his never ending love affair with the Arizona desert in 1925. 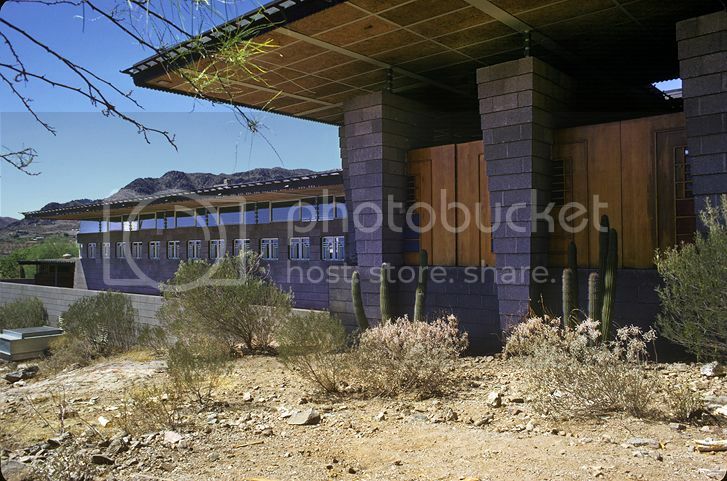 His first camp there was called “Ocotillo,” and was located near Chandler, AZ. 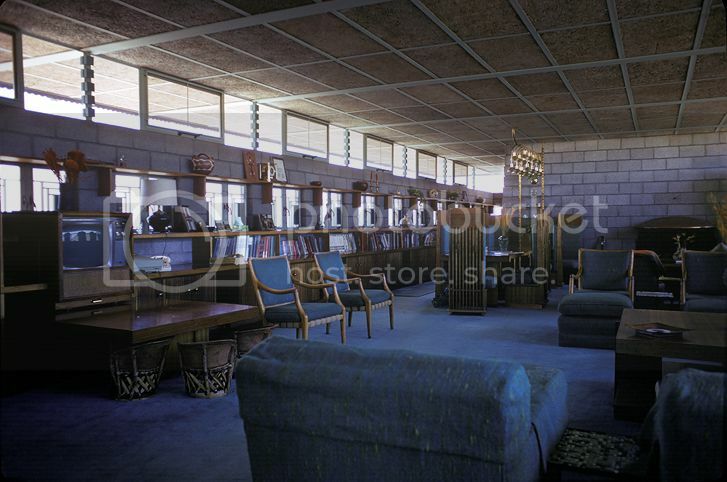 He built his own home, studio and school of architecture–Taliesin West–later in Scottsdale. The desert is sprinkled with some of Wright’s most inspired work as a result of this landscape having captured his imagination. This house was built for H.C. Price who was one of Wright’s great clients. Wright’s tallest building, the Price Tower in Oklahoma, is an important building in Wright’s legacy. Wright also built homes for the Price children. This residence is the length of a football field and has 4,781 square feet of floor space. It was a gorgeous Spring day in April of 1972 when I came a knockin’ at this Wright masterpiece. The gentleman who answered the door was Sam Shoen. HeÂ told me he was head of the U-Haul company–a multibillion dollar cooperation he started on a shoestring just after World War II. With 11 children Shoen utilized all ten rooms, five master bedrooms and two servant’s rooms. Wright created this atrium, a large shaded area with a cooling fountain. The “floating” roof captures breezes. It floats two feet above the walls on narrow steel pylons atop massive concrete block columns which end short of the ceiling and taper toward the floor. Wright’s timber burning fireplace keeps the area warm in winter. The Master Architect’s beloved low horizontal lines blend peacefully with the desert. 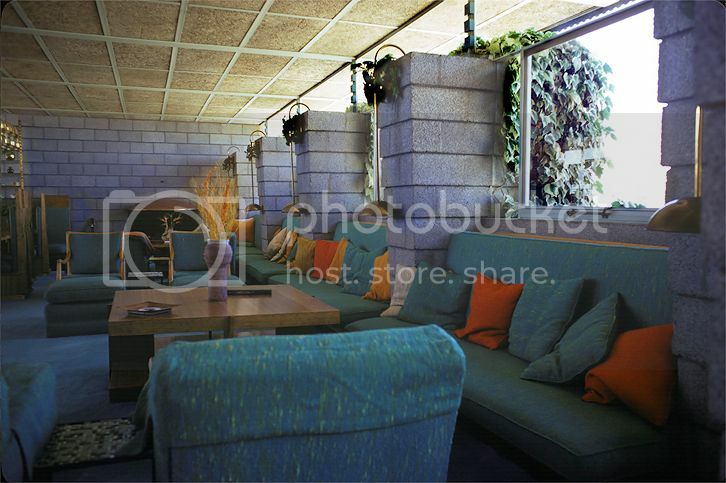 Wright lavishly furnished the home–every detail is of his own design. 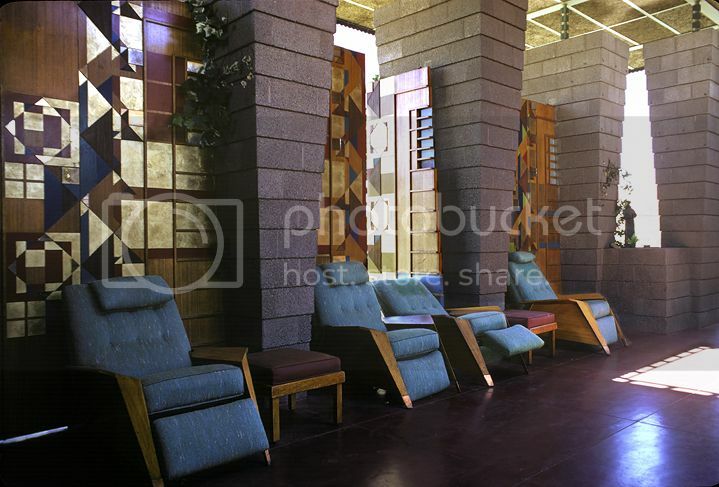 Here are lounge chairs before decorated doors and screens. 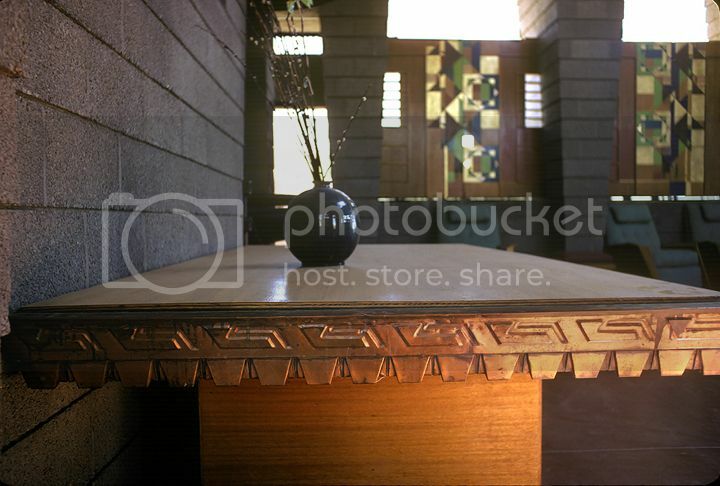 Detail of a Frank Lloyd Wright custom table. The living and dining room. Built-in seating. This room, which opens to the atrium, can host a massive party. 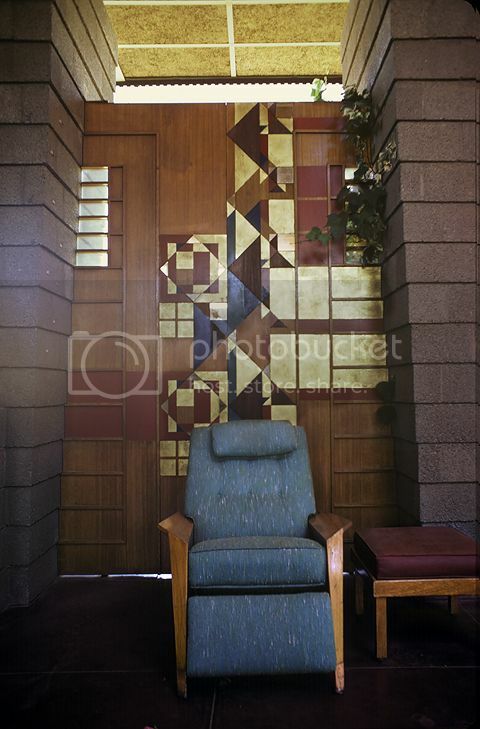 Atrium lounge chair and door panel detail. 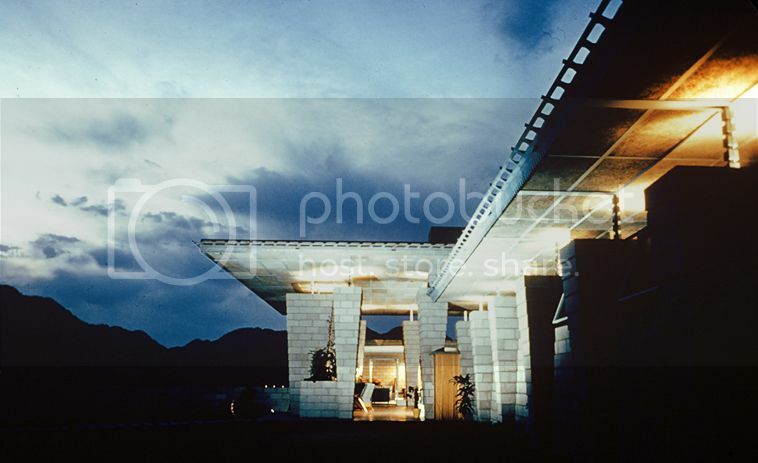 This silhouette visually defines the floating roof. It even made an episode of TV’s “Unsolved Mysteries.” A family of murder and mayhem! My day there in 1972 revealed none of that. Shoen was patient and friendly while I invaded his privacy with my camera. I read a blog recently of someone trying to take pictures of this house and was NOT warmly greeted. The photographer lamented not being able to find any decent views of the home. Such a different world now than when I had this opportunity back in ’72. I doubt I would be able to get into very many homes like I did back in the day. The online article is noteworthy because of the comments made by people apparently connected with Shoen. I drove by that house quite often while living in Phoenix. You can’t see much from the street and I was curious about it (though not enough to actually do any research 😉 Curiosity sated.